Welcome to Jayhawk Oilfield Supply! Yes! You want to keep your production operating at full capacity and your downtime to a minimum. Jayhawk Oilfield Supply has stores located in Spivey, Pratt, Medicine Lodge, Coldwater, Hugoton, Oakley, and Great Bend, Kansas. Our stores have a reputation for stocking a broad-based inventory as well as providing quick and efficient service and delivery. The stores are managed and staffed by full-time, experienced employees who are dedicated to meeting the specific needs of our customers. 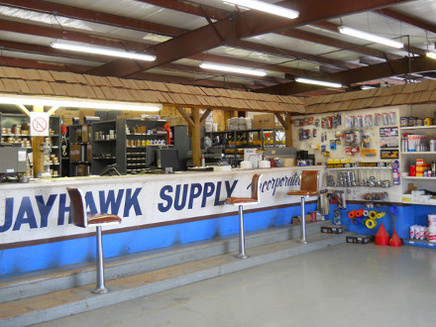 Jayhawk Oilfield Supply provides retail sales of new and used oil field equipment, repair parts and supplies. Equipment includes pumping units and engines, tank batteries, wellhead fittings, downhole and leadline tubulars and fittings needed to complete a well and put it into production. Parts and supplies include a full spectrum of repair parts needed to maintain production, transportation and storage facilities. Services include downhole pump repair as well as head, magneto and clutch repair performed in the shop. We have “parts trailers” that are stocked with valves and fittings necessary to plumb in wellheads and tank batteries. Jayhawk will deliver this trailer to the well site and pick it up later when the job is finished.